With so many brands of nut milk bags on the market, each with appealing features; finding the best one can be a hit or miss. But if you will follow this article religiously, then you should have no problems. 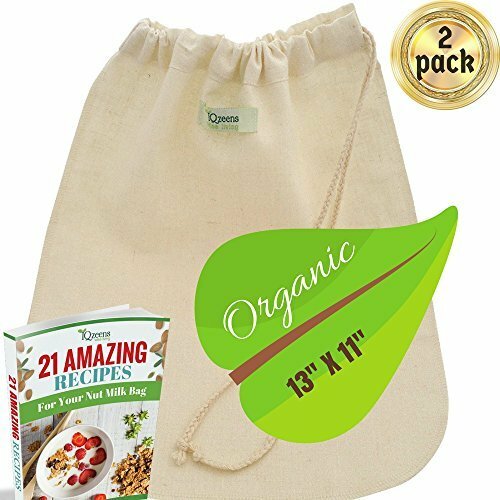 You will find some of the best nut milk bags here together with the reasons that make them the best. Using a nut milk bag is as easy as you can imagine, but the results are always magical. This bag gives far much better nut milk than using a cheesecloth (which is what many use to make nut milk). Nut milk bags are so cheap that are usually bought next to nothing. Here are our top picks for the best nut milk bag. How To Use A Nut Milk Bag? Why to Make Nut Milk? 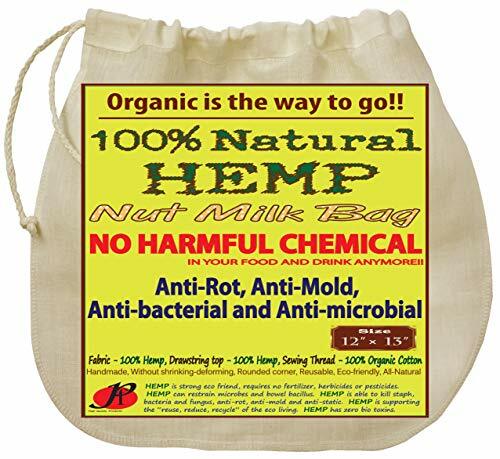 If you are someone who likes to keep it all natural, then this hemp nut milk bag will be very appealing to you. You will also like the fact that is has a large capacity measuring 13” by 12”. This is among the largest nut milk bags I have ever seen. Being this large means the mouth will be very wide. As a matter of fact, it fits on many big blenders like the Vitamix, Blendtec and many others. This will enable you to make juice easily from your blender if you do not have a juicer. The mesh strainer is really fine and there is no pulp that finds its way into your drink. Its holes are only too big for the milk but anything larger that that is brilliantly trapped. You will also love squeezing it as it is easy with the addition of the curved bottom, which also makes cleaning quite easy. The seams too, look to be pretty strong and they give the confidence that they will survive for a while, making this nut milk bag very reusable. And the fact that it uses 100% organic material is in itself an advantage which is also why I would not mind but recommend this to you. Here is another nut milk bag perfect for those who like to keep it natural. It is made exclusively from organic material and I must say that it is very solid. You might even think it was made to carry rocks. The mesh used is really fine and you will have no issues in as far as making great nut milk is concerned. As for the seam, it too is quite a pleasure to pull as it gives the confidence that it will not break anytime soon. This nut milk bag is quite large measuring 11” by 12”. Cleaning it is easy, but I think nylon might be easier than this. But, all in all, it is not like you will be complaining that this is hard to clean. Actually, you will not even sweat with this. It also dries really fast. In an effort to not be outdone, this also has a curved bottom. And for a bonus, you will get a bag you can use to store this friend safely. Another very popular and best selling nut milk bag you will go to bed singing about. That is how good this is – not hype. What more would you expect when it has everything you would need in it anyway? It measures 12” by 12” which is pretty large for a nut bag. If you are not aware, this makes it easy to pour food in into the bag without spilling it all over the place. Additionally, it also means it can take a larger volume which will save you time. And lastly, being that big makes it easy to hold and sneeze the milk out. Like with the previous nut bag, this one is also made from food grade nylon mesh and it is BPA free. You can pull this and squeeze it in every way you want and it will not stretch or tear, that is how durable it is. The strain is also very fine that everything that is supposed to get out does so and all that is meant to stay in the bag obeys as well. This enables this bag to yield nut milk that is of a great texture. And like you would expect, the milk also tastes awesome and has a nice flavor (you will realize this if you have been using a cheese cloth). Cleaning this nut bag is so easy. And as for drying, it could have never been any faster than it already is. So where on earth will you get some nice recipes to make nut milk after buying this bag? Will you spend more money on some recipes ebook? Definitely not because the moment you buy this, you will have access to a free recipes ebook and how to videos. And all this comes at a very low price that your wallet will not notice that money has been spent on something else. 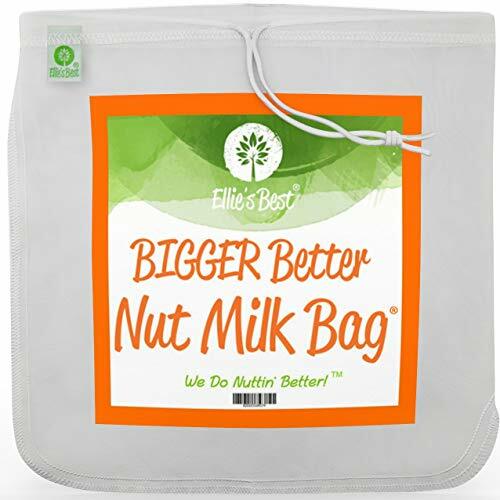 All in all, great nut milk bag from Ellie’s Best. The Vita nut milk bag is giving its competitors a good run for their money. I am not referring to those that break on first use by the word competitors. I am talking about those in the top league like the ones we have seen above. This bag is as strong as the previous ones meaning it you will serve you for some time. You can squeeze it as much as your want, but the chances of tearing it are very slim. But being so strong is nothing if the nut milk bag delivers a lousy job. Fortunately, it does not disappoint in any way. The nut milk always tastes great and the bag is equally good at other tasks like cold brewing coffee. Using it is as easy as you can imagine. It has a fairly large opening that is totally useful. This makes it fit easily on most containers and jars. And being large also means you can make more nut milk at once than dividing it in several small batches. Again, if you have been using a cheese cloth, you will realize that you have made a big and progressive upgrade when you decide to buy this. As for cleaning, I am glad to tell you that you will not find any troubles in regard to that. You can simply use soapy water and let it dry. Using colored, however, has been known to stain the bag easily. So you should make sure you clean it thoroughly if you still want it to look good. But this applies to most nut milk bags. Coming at such a dirty cheap price, it is really hard to fault this one. If you are looking for a large nut milk bag, then you will be well off with this one from Diana Stobo. It is inexpensive and fairly durable. As with the others, this one is also made from food grade nylon. So it will not lose its shape even after being abused a couple of times. Unlike with the other nut milk bags, this has the seams at the sides. On first glance, this appears to make cleaning really easy. But to me, they do not seem to be too strong to survive for years (I do not believe you anyone would buy this thinking it will last years anyway). The overall construction is pretty good and quite solid. You will also find a pull string that is simply a joy to use. And like I said, this nut milk bag has a large capacity. It can hold 2-quarts of whatever nut milk you want to make. As noted earlier, this saves you time and makes squeezing the liquid out very easy. The material is very fine and it makes some good quality nut milk. Another thing to like about it is its wide mouth. This is not a surprise from a nut milk bag this big. It can easily fit on big containers with so much ease. 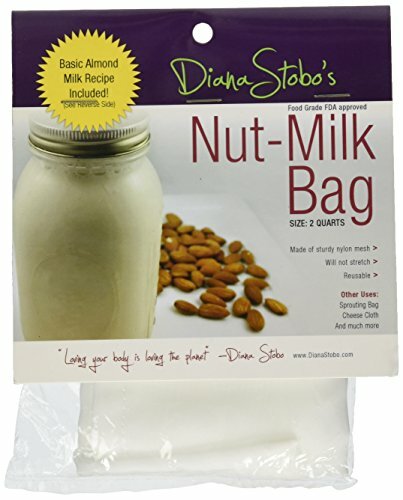 All in all, another great nut milk bag, this time from Diana Stobo. If I must admit, this is my favorite nut milk bag. Its advertisements claim it is of premium quality, and you can easily see that it is indeed tip top quality. Like we have come to expect, this one is also made from nylon and it is BPA free. Its biggest selling point is its strong construction. It comes with an ultrasonic welded seam that makes it look smart, strong and makes it really easy to clean. You can tell that you will use this for years without worrying about anything. It also has a very large capacity measuring a whopping 1 gallon. So if you have a big family that needs a lot of nut milk, this appears to be a very sensible investment and you will save a lot of time in the process. And talking about the nut milk that this makes, I can only say it tastes as great as you can imagine. There is no pulp that escapes as it is very fine. Cleaning this nut milk bag is again nothing to worry about. It has a rounded bottom meaning nothing hides in any corners. Drying is as fast as we have seen on many great nut milk bags on this list. It comes with a drawstring you can use to hang this beauty for even faster drying. As if all that is not enough, you will get a free recipe book that is very useful. And to show that they believe in their product, you get a 2-year money back guarantee. It is another fairly large nut milk bag that is also very strong for multiple uses. It measures 9.25” by 11.5” and it can hold up to 2 quarts. And for the sake of saying it, this is also made from nylon and it is BPA free. The construction is again one of the best I have seen and it too has a rounded bottom. This means it is easy to clean and squeeze the milk out without any of it coming out. 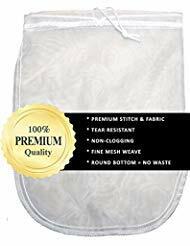 It comes with double reinforced safety stitches and you can easily tell that this nut milk bag will be your next best friend in the kitchen for years. As for cleaning, it is easy just like with all great nut milk bags. All you do is turn it inside out in warm water, then air dry it. And to make it easy for you to safely store this gem, it comes with a sealable storage porch. This keeps it safe from harmful bacterias and dirt which might have effects on your healthy. And if you happen to not like it or if it gets damaged withing one year, you can have your money back with the 1-year money back guarantee that comes with this. Again, I am not afraid to recommend this Nutriana nut milk bag to anyone who is in need of something like this. enKo Products has its own nut milk bag and it am glad it is quite good that it surely deserves a spot here. Like with every nut bag on this list, this one is also of a very good quality. It is made from nylon which seems to be what every manufacturer is going for in making these bags. The construction is again something to commend. The seams have a triple stitch instead of one we usually find on many nut bags on the market. This is a great addition as it makes the bag really strong that someone might literally mistaken this for a punching bag. From the looks of it, this will be able to stand a lot of pulling for a number of years. Additionally, all that squeezing means you will get the maximum amount of milk every time. And talking about the milk you can get from this, it is nothing short of impressive. But the bag also excels with other tasks that need squeezing the life out of food like cold brewing coffee. For those who are still wasting time with cheese clothes, it is high time you gave something like this a try. It is very reusable and so easy to clean. And if you happen to not like it, then its two-year warranty and a 100% money back guarantee should put your fears at bay. Just when it seems like many manufacturers are trying to avoid making nut milk bags with corners, Pure Life Care did not mind but still went with one that has corners. But this design is not all that bad even though it might not be the best companion for cleaning and squeezing. Its biggest advantage is that it makes pouring the drink from corners really easy. This might come handy when you want to direct the liquid into a funnel or something that does not have a big mouth. Getting to the construction, this uses nylon like many other nut milk bags we have seen here. It measures 13” by 12” making it one of the largest bags around. So if you have a lot of food to work with, this is probably something you should be looking at. And as a bonus, you will also get a free e-book with the purchase of this nut milk bag. Although many like to keep the best for last, I like to start with the best. And for this review, there is no better way to start it than with one of the best selling nut milk bags on the internet. It is very strong that even the Hulk could make some nut milk in this without tearing it. From the moment you will set you eyes on it, you will realize you have something meant to last. Even the seams prove that this nut bag will be with you for a while. Adding to its durability is that it is made from food grade nylon. And research has showed that this material does not have any effects on your healthy. And talking about healthy, this nut bag is BPA free. When it comes to using it, you will love the quality of nut milk this makes. It is always of a good texture due to the fine nature of the material used in making this nut milk bag. Being so strong means it is very reusable. The only thing that might get in its way perhaps is you and your cleaning abilities. But fortunately for you, this task is so easy. All you do is turn it inside out and rinse it in warm water then let it air dry. It will be ready for use again in less than one hour. You will also get a bonus in the form of a free recipes ebook. And if anything ever happens to it or you end up not liking it, the manufacturer offers a 100% money back guarantee. All in all, a highly recommended nut bag that you will not regret investing in. Apart from the different brands around, you should consider the size of the nut milk bag. If you know you will be making a lot of nut milk, you will certainly need a larger bag than one that can be used by someone making milk just for themselves. You will also need to decide on the type of material used to make the bag. Usually, the majority of nut-milk bags are made from nylon. You will also find some that are from hemp. Whichever one you choose to go with, it is simply a matter of choice. Durability should also not be overlooked. These milk bags need to be strong as there is a lot of squeezing and pulling. Both nylon and hemp are strong. But the material used is not the only thing to think about, the seems also matter. Try to see if they look solid. And like with all things in the kitchen, make sure the nut milk bag is easy to clean. You do not want something that ends up like a cleaning cloth with just a few uses. One other thing, though not that important, is the shape. Usually, you will find rectangular nut milk bags and others with rounded bottoms. Do not be startled, however, to see one in a V shape. Making nut milk in these bags is really simple. I will show you how to do it below. Once there is no more liquid coming out, you are done. All you have to do now is refrigerate your milk and use it in place of dairy milk. Apart from being delicious, there are other valid reasons why you might need to go for nut milk instead of dairy. Of all these, almond seems to be the most popular. It tastes great anyway, so not a big surprise that most people use them for their nud milk bag.